It is precisely this untapped potential that Flexound are focusing on. The company has developed a smart pillow that combines high-quality sound and sound wave vibrations, allowing you not just to hear but also to feel the sound. “Music is like a miracle drug. When we hear music, we begin to produce dopamine, the feel good hormone, while the vibrations promote the release of oxytocin, also known as the cuddle chemical, which reduces stress hormone levels in the body. Together, these hormones are really good for you,” Heinaro explains. In fact, it is precisely the team’s desire to do good that is the driving force behind Flexound as a company. Jukka Linjama, one of the founder members, first began to develop a new technology that would combine music and vibrations to help his wife, an occupational therapist. No one had ever attempted anything similar before and Linjama first secured a patent for his idea in 2014. He was left with a sense that the technology could have a broader application but the idea remained on the back burner, until he met Tommi Immonen and Mervi Heinaro. “I immediately recognised the potential of Jukka’s idea and I knew that the engineers would need someone that could help them commercialise what they had,” Heinaro explains. That was the beginning of the Taikofon, a huggable, tactile pillow intended for therapeutic use. As the technology combining music and vibration had proved such a success in the therapeutic setting, the team set about spreading the joy a little bit further. So far, the double effect of music and vibration is relatively little used in the entertainment industry. This insight led to the creation of the HUMU smart cushion. “Taikafon and HUMU have a different design, a different brand and a number of technical differences, too. It was important for us to keep the therapeutic product separate from the entertainment market,” Heinaro says. The consumer market offers virtually limitless opportunities for utilising the music and vibration technology. There are no restrictions on the type of sound content used and technology is a perfect fit with films, audio books, radio or Spotify and many other uses. Virtual reality also represents another great opportunity. Flexound’s success in the Kasvu Open competition, which seeks to identify Finland’s strongest growth company, gave the team to confidence to believe in themselves. With HUMU, Flexound has set its sights on the Chinese market and the team have already convinced one large local retailer to stock their product. The search for new international partners remains very much ongoing. “You can’t grow if you’re not willing to enter the global market,” Heinaro points out. HUMU will be in Finnish shops in the new year, after launches both on IndieGoGo and in China. It is highly likely that we will be seeing a number of new products that bring together sound and sensory experiences in the future – there may even be some copycat products around – but Flexound are determined to be the first on the market – flying the Finnish flag all the way. 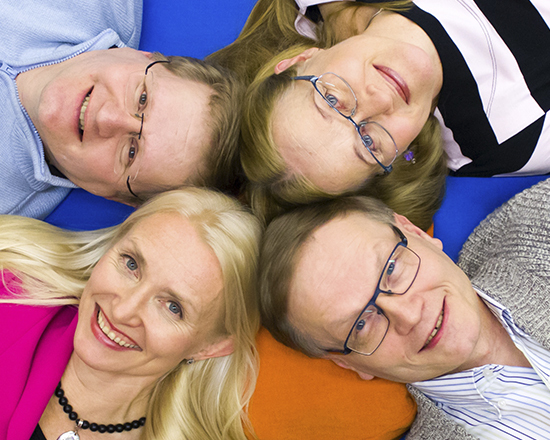 Flexound team is well seasoned: (left) Mervi Heinaro, Jukka Linjama, Mirja Linjama and Tommi Immonen.